I like to drink coffee, but I wouldn’t consider myself a coffee connoisseur. I limit myself to just one cup a day: large, black, one or two sugars. Many times, I’ll opt for black only. People who know my coffee preference cannot fathom drinking it damn near straight like that. No creamer? No cinnamon? No nutmeg? No foam with caramel swirls and chocolate accents? I say, for good or bad, I want the most truthful flavor I can get…with the occasional bit of sweetness. Cartoonist Robert Crumb in 2010. In the mid 1990’s, while a relatively clueless sophomore undergrad, I first discovered the work of cartoonist Robert Crumb. I didn’t find it in some dusty old comic shop tucked away under the $1 boxes, it was from a phone call from my Aunt. She said there was a movie out about a cartoonist and that I should check it out. The movie was called Crumb directed by Terry Zwigoff. After seeing it I was blown away… and to a certain degree I’m still in the wind. 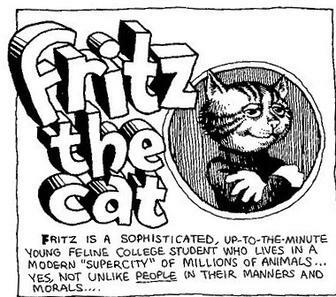 The pen and mind of R. Crumb gave us the iconic underground comic characters Mr. Natural and Fritz the Cat. His work in the mid to late 1960’s contributed to the growing, subversive underground comix movement. (A lot of that work was the direct result of Crumb’s hallucinogenic drug experimentation.) Any serious webcartoonist can draw a lot of interesting parallels between what the underground cartoonist did in the 1960’s and what is happening on the web now. The underground artists couldn’t (or didn’t want to) break into the mainstream with their work. The content they produced would never fly in the very conservative, white bread mainstream America. To get it out there, they self-published. No editors, no agents… just homemade, censorship free comics. These comics appealed to a specific audience- the hippie, counter-culture crowd. They were available in places these groups would go…head shops, coffee houses, small bookstores. I personally think that to be a very strong parallel. I mean, there are gamer webcomics for gamers, furry webcomics for furry lovers…the examples are boundless. Webcomics all produced free of any corporate or syndicate entity for a specific audience. Hmmm… is history repeating itself? I think so. Crumb’s work can and has been called sexist, racist and to a certain extent mutinous. His women are drawn not as the prototypical spandex clad, perfect beyond perfect bodied beauties. They are drawn buxom, big-boned and more real than any mainstream comic company could, or would ever produce. The men are mostly drawn as over or under-sexed buffoons. He (too truthfully) draws himself as a sniveling, scar-covered, snaggle-toothed freak. He has a very dismal, bordering on separative, opinion of popular culture and yet, in a way still contributes to culture. How many artists can be said to still be producing relevant work even after 50+ years? So, why do I consider him one of the greatest influences on my work ever? Crumb’s work is very old-school. He relies on line for everything. Line is depth. Line is value. Line is space. My first impressions of his masterful cross-hatching reminded me of the old engravings of French illustrator Gustave Doré. (Examples of Doré’s work can be viewed here. ) I first encountered Doré’s work in 9th grade English class – reading an illustrated version of Samuel Taylor Coleridge’s The Rime of the Ancient Mariner. Each and every single mark not only has a meaning, it has a very specific job to do. I sought to replicate the engraving technique in my own work. When I saw Crumb’s cross-hatching all those images I saw nearly 7 years before came flooding back to me and it all connected. If I wanted my work to look alive, I’d have to develop a characteristic line quality…and draw A LOT of them. As you can see from the example at the right, Crumb’s cross-hatching is second to none in scale, variety and detail. Volumes of text can be written about those lines… but a true education of his line simply comes from looking at them. Crumb has cited original MAD cartoonist Harvey Kurtzman as a major influence on his work. My work has a strong negative element. I have my own inner demons to deal with. Drawing is a way for me to articulate things inside myself that I can’t otherwise grasp. What I don’t want to do, what I dread more than anything, is to leave a legacy of crap. I don’t want my work to be tossed in the dustbin of history, and become more of the second rate, mediocre junk that future connoisseurs will have to move out of the way so they can get to the good stuff. Lately though, I’ve become more interested in “the journey within,: the great adventure into the unknown inside one’s self. Isn’t it strange that we are such a mystery to ourselves? What a crazy paradox! I think one of the greatest powers we humans possess is “singular focus.” In my youth all my power was focused down into my left hand, through the pen and onto the paper. Because I lived on paper, my work was strong. …I like the Rocky metaphor. This world is always going to be bigger and more powerful than you are, but you’ve got to deal with it. Life is active struggle. As Rocky says, “I know I can’t beat this guy, I just want to go the distance with him. I just wanna be still standing at the end of the fight that’s all…” That’s the only victory you can hope for. You’ve got to figure out a way to stay in shape, and stay alert, to keep standing. The line ‘drew’ me in, but the honesty is what is keeping me there. Crumb wasn’t the first cartoonist to put himself in his work. Out of all the cartoonists that do autobiographical comics (there are way too many to list here) he’s the one that really sticks with me. There are a few times when I find his truthfulness almost offensive. He’s an artist that I wouldn’t necessarily want to hang out with all the time. At least not initially. Of course, that’s pre-supposing that he’d even want to talk to me. You don’t have to like an artist to appreciate what they do. Yes, art is a direct conduit to who the artist is. You can appreciate and separate the two… otherwise, would any of us ever look at anything? In my work, I keep it honest. I may hold off on being “R.Crumb” honest, but I think I get very close. I like my comics like I like my coffee… honest. R. Crumb and Peter Poplanski, The R. Crumb Handbook [London:MQ Publications, 2005], 298-300. Posted in Conversations, Drawing, Featured News, Writing and tagged cartoonist, comics, Influences, webcomics. ← Where Did You Get Your Books Printed? Great article, and I agree “You don’t have to like an artist to appreciate what they do.” Crumb’s work is always going to be controversial, but heck you see that all the time in the art world, it’s creativity, it’s who we are coming out onto canvas, into the clay we mold, into the stories we write. Like Crumb, you do it for the joy of doing it, not for the masses to unload heavy heaps of cash upon ya,though that would be nice. His line work is phenomenal, I have always loved the cross hatching and line work that artists such as yourself even today put into their work. It does bring a life to it, and is an art form that has been around for a long time. It’s just amazing what a line can do. I love the parallel with the 60’s underground art scene and the online comics of today. We’re seeing a really cool part in history all around us taking place each day. Sure you have those that do it to hopefully make it big, but then there are others that just love doing what they do and sharing that with others. Along the way we are seeing tons of creative minds come right to us daily, we don’t have to read about them 20 years from now, we can experience their growth right along with them today. In a way taking about Crumb ties in with my first article about discipline. Getting to the top just means you have to work harder to stay up there… not that Crumb is interested in that. Drawing is another form of breathing to him, which is clear by the sheer volume of work he has produced over five decades. Another good documentary on Robert Crumb is “The Confessions of Robert Crumb”, although the one you mentioned is the better of the two. What I love about going from the documentaries to reading Crumb’s work is a look at Mental Illness. His entire family clearly has mental illnesses (too many to list). I considered Robert Crumb to also be mentally ill in some regards, but he has found an outlet for it in his art. I find this fascinating and is what has drawn me to his work. Crumb’s brother Charles committed suicide shortly after the Crumb movie was shot. I agree that R.Crumb does have one or two issues floating around in his mind… but the art saved him from succumbing to those demons. He could even be considered a poster child for the good art therapy can do.